Fulfill your dreams and escape to the heart of the Jura and stay at the Indigo La Plage Blanche campsite! Located on the edge of the Loue, in Ounans, this 3-star establishment is ideal for nature lovers looking for a quiet place to relax. 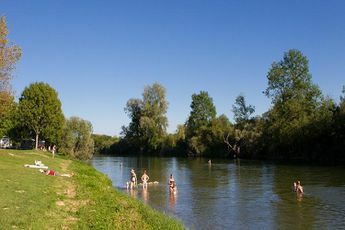 To the delight of escapade enthusiasts, the Indigo La Plage Blanche campsite offers easy access to the tourist sites of Franche-Conté, including the Royal Saltworks of Arc-et-Senans (13 km) and the city of Dole (20 km). Located in a natural setting with many quality services, the Indigo La Plage Blanche campsite is a travel destination not to be missed! Relaxation and escape are the key words here! A pool with a separate children's area, a sports ground, a playground for children... these are just a few of the available facilities. As for activities, chosse between childrens games, sports competitions, fishing and nature walks. Make the most of the of the stunning area of Jura fo a fun and lively stay. For a successful stay, discover, among other things, a café-restaurant, a grocery store and a baby equipment rental service. Nearby, do not miss the Royal Saltworks of Arc-et-Senas, a testimony to the industrial architecture of the 13th century. Its creator has designed an "ideal city" in a circular shape, with a director's house, workshops, warehouses and even housing for the workers. The Citadel of Besancon, located in the capital of Franche-Cont? 35 kilometers away, is filled with history from Julius Caesar to Vauban, and is rich in relics and old stones, including its 13th century cathedral with its astronomical clock, made up of some 30,000 parts and 70 dials! Dijon, the capital of the Dukes of Burgundy and located 65 kilometers away, can also be a good reason to take a walk around the region and take in its beautiful landscapes, which still often remain untouched. The forest of Chaux offers many potential outdoor activities, Salins-les-Bains is a saltwater source, and the city of H?risson has pretty little waterfalls that will delight children.